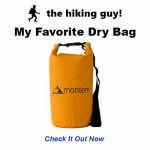 Want a dry bag that’s light and compact and even easier on your pockets? Give The Friendly Swede Compact and Lightweight Dry Bag a try! Coming with not one, but 2 Packs, these dry bags are the stuff quality is made of. So what is the one thing that sets apart this package from rest in the market? Well, it isn’t the additional bag at the price of one, but the overall quality that is remarkable. Most of the travelers and tourists avoid going outdoors or continuing exploring during the rainy seasons. The reason is that they might have to carry around books, tent, sleeping bags, or even electronic items like the camera, lens, and tablets to name a few. These would need to be away from rain. But that is where the Friendly Swede Dry Bag shall come in to rescue. The PVC Tarp body with the double-layered bottom brings in strength to the body. It is one of the top aspects, which will be responsible to ensure that your personal belongings remain dry even as you go on a snorkeling, kayaking, canoeing trip or even to a weekend rafting expedition with friends. Get your hands on the smart 5L or the bigger versions as per your requirement. Water-Resistant: The Friendly Swede Dry Bags score high on one area and that is the rating that it gets for each of its water-resistant bag. The international rating of IPX5 guarantees that anything that goes inside this bag remains dry. This is of industrial grade too which means it shall be perfect for keeping the contents dry. But there is a point that one has to understand and that this bag is not a flotation device. Stitches and perfect body material: The 500-D PVC TARP shall be reassuring to those who go on adventure sport activities. Those families shall now go on camping trip and not even worry about going in any season. The dry bag from the Friendly Swede brand is one of the best for any season. The contents shall remain dry and moisture free since the stitches are perfect. There is double –stitched, scrim –reinforced vinyl bottom bags are ideal for long journeys. That also means that you need not worry about the durability and they shall remain in shape for a long time to be your travel partner in many future trips. Ease of maintaining: You shall easily manage these since all that you have to do to pack it away is to roll it in to a plastic tube after a trip. It shall keep it ready for your next trip. Lifetime’s warranty: The Friendly Swede Lifetime Warranty is one of the things that you shall get from this brand. This means that you shall get to use your own dry bag for many days, and years to come. Colors and capacity: The Friendly Swede dry bags come in four colors- blue, black, white, and yellow. These colors are very striking and users who have bought this bag find it amazing. The dry bags come in few top sizes to suit different needs. The five liter 170oz sized bag shall be right for the kids, and for carrying small items like the tablets, smartphones, and even books, and towels to name a few. The 10-liter 340oz sized bag is perfect for things for a day or two or even for packing in the camera or other travel gear. Since the bag is water-resistant,it shall be perfect for even packing in your foods and medicines. Easy to carry and lift: The small and medium sized Friendly Swede Dry Bag comes with firm shoulder straps. This shall help you to just pack in your personal belongings and throw it on your shoulder. While you go on a tour, take risky hike through forests, or even position your camera with both the hands, you shall not have to carry your things. These straps are perfect for positioning the bag on your back while you go trekking on high lands. Take a look at the customer reviews on Amazon.com, and you’ll instantly notice the enormous number of positive reviews. This model has an average rating of 4.7/5 stars on Amazon.com, and we wouldn’t dare read this different. 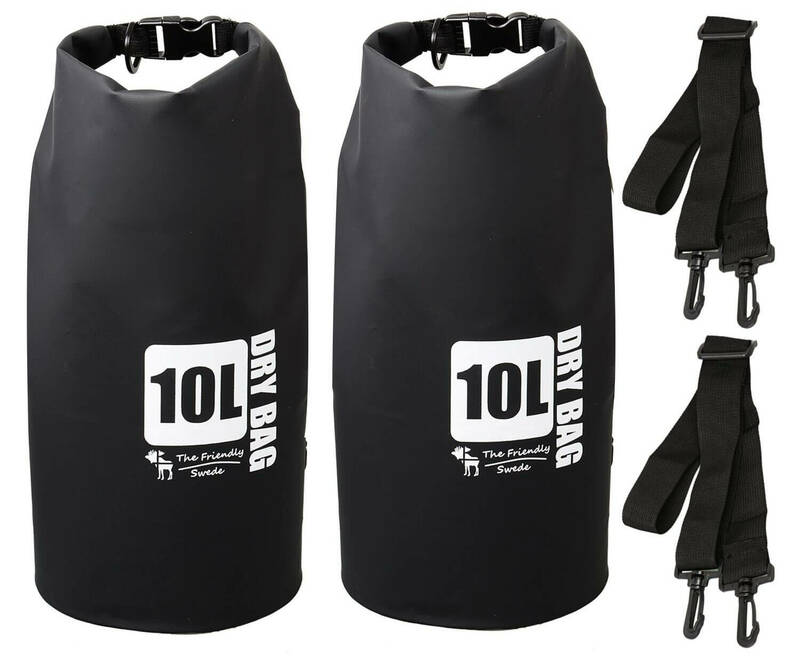 One of the top reviewers, Debra G says that she uses the dry bag for kayaking and loves it because it is much less expensive than other competitive products. She has also praised the carrying straps for being extra useful. For all this dry bag is worth, you can expect it to last you for a long time. A very essential commodity that every traveler must carry on every trip besides a good book, some dry clothes, and food is a dry bag. Friendly Swede understands this need and here comes the top quality bag of 500-D TARP that does just that. The dry bag comes with Lifetime Warranty that only gives the buyers more reassurance than ever. Just pack in your things, seal the top tightly and you are ready to hop, skip and run around.